I find it interesting that cancer has manifested within the visual cortext of my brain. It’s in the back left lobe and is impacting my vision and sometimes my balance in a negative manner. The other day two friends and I sat down in the floor on my living room rug and began to talk to God together. As we prayed, we asked the Lord what I needed to know about my healing this time around. I immediately saw the CyberKnife in my minds eye and in the same moment had the thought that the Lord is light. The CyberKnife works by projecting a fine stream of light and waves in tiny fractions at a specific trajectory to destroy the lesions. God showed me that he himself is coming to heal me as light through this machine. He, in his infinite mercy and wisdom, has allowed man to channel a fraction of his infinite light and manage it in such a precise measure as to project, direct and release the power of that light through this machine. I realized that if God released His full light on me, it would destroy me. My flesh could not withstand it. Yet by taking his infinite glory and light and shaving it down to such a small beam, he is in effect setting me in the cleft while he proclaims his name over me and allows his goodness to pass by. All that is required of me is to obey, to get into the cleft, to lie down, to submit, to rest. As I surrender myself to his treatment, all his goodness is passing by. When I lie on the machine each day – I look at the head of the device and I have begun to thank God that he would humble himself in such a manner on my behalf. Who am I that God would go out of His way to so carefully meet my need for healing? He is the same God that so humbly submitted himself to become a man, entrusted himself as an infant to the care of a teenage mother and who laid down his divinity in order to become a sacrifice for my every need. With each click and shutter reset, he’s giving me such divine attention. He’s using his light to seek out and destroy the darkness of cancer and he’s doing it all within the optical processing center of my brain. 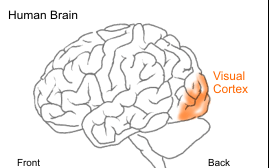 The visual cortex is where you actually process light. Light pours in through the optic nerve and strikes the rods and cones at the back of the eye. When the light comes, it creates images, vision, sight. Here is where you recognize color, brightness and contrast. Some would say this is the place of illumination, revelation and inspiration. God is not only healing me but He is in fact showing me His glory. And as His glory passes over my eyes, I will see. So this leads me to a couple of specific prayer requests – one natural – one supernatural. One of the side effects of this treatment is that it can produce edema (swelling) at the site of treatment. Because of the special protection around the brain, it takes a little longer to wash away the dead cells that are being produced with each treatment. If they remain they can press against my brain extending the damage to my sight, creating a sense of instability and increasing the visual disturbances. Would you please pray that in the next two weeks my brain would completely be washed by my immune system? That every single residue of cancer and the corresponding fluid would be washed away? That the tissue of my brain would be clean, healthy, vibrant and able to be restored? I am asking God to not just destroy darkness but restore my sight. I am also asking God to increase my prophetic insight. I desire to do more than to see in the natural. I want to understand the things of the Holy Spirit. I’m asking God to make me a better “seer”, a better encourager, a better receiver. I want the enemy to so regret that he would attempt to interrupt my direct line of communication with the Holy Spirit and I want my life to amplify the tiny shaft of the light of God within me. Thank you for your continued outpouring of love and support. My family and I feel your prayers. I have shared that in moments, I feel cocooned in them. Safe, carried, loved. You are the most extraordinary people – faithful and true. I am grateful beyond measure for your compassion and love. You will walk through the fire and not be burned for I am the Lord your God. Praying for you Ps Jan! Love & Hugs!!! Miss seeing you – but thanks for this note. I feel loved. I love you Donna. Your prayers are so important. Thank you. I’m going through to healing. I’m in awe at how God revealed his ways and means to you. I’m encouraged to hear your heart in this healing process. Saturday I saw you stride down the hall at church with a smile on your face and in your eyes. You are loved and being rooted for by so many… Especially your Heavenly Father. Being at church is like being soaked in the love of a family. It’s easy to smile and be happy there. I’m so glad you caught me – next time say hi! Praying for you Jan to be washed in the healing blood of the Lamb. May all that is from the darkness be brought to the light and destroyed. Dave – you are on my mind everyday. I am praying for a complete restoration and healing. Your encouragement to me is priceless. Your faithfulness is bringing me along. You too are light! Jan, I’m so in amazement in your trust and attitude. I praise God for the insight the Lord has given you for His procedure. I stand in agreement that with each treatment everything that doesn’t belong there will be flushed away and only a healthy brain exists just as God planned it to be. I’m also agree that what the enemy has meant for harm God has turned around for good and you have greater spiritual insight and discernment in the spirit to minister to others. I pray that your inner man will be strength through every step of this journey. I stand with you for total and complete healing in Jesus name. Thank you for those prayers of agreement. I never would have known you were suffering from something like this. You are always so gracious and joyful. You truly are a light and it shines bright wherever you go. Thank you so much for sharing. You will be in my thoughts and prayers and I hope to stay updated through your beautiful messages. I pray for total healing over you in the name of our Lord and Savior, Jesus Christ!!! Love you. Thanks for reading. What a blessing to me. I stand in complete agreement. Our mighty Father is with you. Jan, sweet friend, YOU ARE LIGHT. Through all the struggles, the hurt, the confusion, the pain- you still push through knowing we will read every word. Your transparency in inspiring, and your testimony is being documented in this blog. Thank you for sharing your inner, most personal thoughts, feelings, hopes and worries. We all stand in sweet victory with you. Your words give others the courage to fight heir own battles- whatever they may be. Be blessed today, knowing your prayer warriors are in deep prayer for you. Thanks for this sweet note and for the continued prayers. I am agreeing in prayer with you and am in awe of the grace, humility and brokenness with which you are walking this season out! How beautiful!!!! Much love and big hugs, my friend!